The last decade has not been a good one for the United States in the international trade arena. We have lost over five million manufacturing jobs, and total manufacturing employment in the U.S. is at a historic low of about twelve million. At the same time there are about 100 million people at work in manufacturing in China. This picture doesn't bode well for people looking for jobs in the U.S. If we want to turn it around we have to radically change what we are doing here in the trade arena. 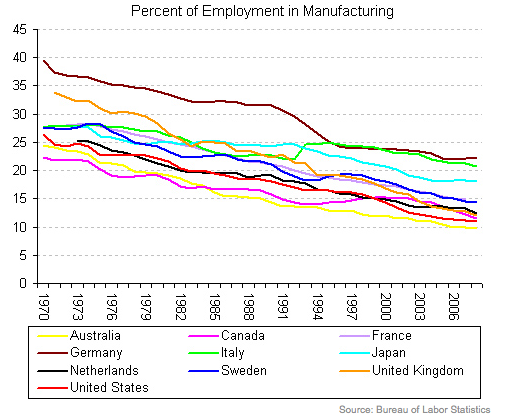 I think this speaks for itself, but just in case you like to read: in each of these developed economies, including the United States, manufacturing employment has steadily declined since 1970. In the US in particular, manufacturing employment was declining before NAFTA, before the WTO, and long before international trade (imports and exports) was little more than a rounding error as a percentage of GDP. And yet Kaplan and his cronies want to completely overhaul US trade law (and do all sorts of other nasty things) because of US manufacturing job losses?